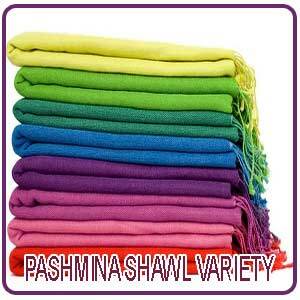 -The Pashmina shawls are also known as Cashmere wool which originally got its name from the Persian word for wool. Pashmina is actually said to have originated from the neighboring country Nepal where they had to look upon various factors favorable to make them warm. This is supposed to be the softest wool across the globe from the Himalayan region and the Tibetian plateau. The wool used in making of the Pashmina shawl is got from Capra Hircus which is a kind of goat more popularly known as Chyangra and found at an altitude of 12000 feet where temperature drops below 40 degree centigrade. The skin of the goat with thin short hair is the most distinct feature of the goat which is used in the making of Pashmina and is best suited for very cold climate. - -History also shows that Pashmina shawls were also used during the period of Mahabharata where it had been the most favourite of the Emperors and Noble rulers for the Pahminas was even referred to as the Fiber for Kings. The fiber of the Pashmina, the King of all wools is the most genuine and the earliest. The art of making of Pashmina is believed to be at least as old as 3000 years B.C. Once upon time it was only the upper class or the luxurious people who were able to afford to use the Pashmina fabrics. Pashmina fabrics attracted the attention of Caesar and in fact were the delight of French queen, Marie Antoinette. Even historical people like Napoleon the great was very much impressed by the Pashmina fiber and its related products and also gifted it to impress Josephine. -Till early twentieth century it was only the royal people or the Kings of Kashmir who had the right to get all the related products of Pashmina from Himalayas and its neighboring countries like Nepal and Tibet. This paved way for the initiation of cottage industries involved in the making of Pashmina shawls in Kashmir. However it is a very laborious process for even a simple plain shawl without any embroidery on it involves nearly 200 - 250 man-hours. It was in the 15th century that Zain-Ul-Abdin, the ruler of Kashmir introduced the use of tapestry shawls in Kashmir. Mughal rulers like Akbar and his successors who were regular users of the pashmina fabric funded the production of making of the shawls. -Later the local government took the sponsorship for the Pashmina shawls. But however when the Mughal empire was disintegrated, the weavers were very badly affected only to be saved by the demand from Europe. By the end of the 18th century, the Pashmina shawls became very popular everywhere and by the 19th century the foreign entrepreneurs authorized the production of the fabric mainly for the French market according to the need and the taste of the Europeans. As years passed by acquiring in the designs and model became very tough and by 1870 the market for Pashmina shawls was collapsed for various factors like changing tastes and competition from Paisley shawls. Another major reason for the fall of the shawls in the European market was due to the defeat of France by the Russians.So the weavers in Kashmir had to cater to the British Officers in India and few even migrated to Punjab. After a long struggle here and there, Pashmina has found a standard place both in the Indian and the other country markets. People have been -It is during the period of spring the Chyangra goat sheds its inner coat and each goat gives about 3-6 ounces of the fiber. But however due to the increased demand for the Pashmina products the goats are now commercially reared in the desert area of Gobi which has a similar climatic conditions to that of the Himalayas. This desert area gives acres of grazing ground for the specially reared goats. Thus the shed inner wool is collected and undergoes various process of spunning to get the final Pashmina fabric. Even today in the Ladakh region of India where the temperature drops to -35 degree Celsius there is a group of Nomadic tribal people known as Changpa who rear the goats for the production of Pashmina in extreme freezing climate. As said earlier once the inner coat of hair is shed the soft fine Pashmina is separated from the thick coarse hair and is taken for further process. -Once the collection is done the yarn undergoes the process of stretching and cleaning to remove the unwanted waste materials and then soaked in a mixture of rice and water for few days so that the raw material becomes soft and ready for the next step. Then the spunning of the yarn with hand on a spinning wheel known as Charkha takes place and this is quite laborious and causes pain to the hands. Hand spinning mainly needs tolerance, efficiency and commitment. It is too difficult to do the weaving on power looms for the vibration is sure to cause damage to the fragile quality of the Pashmina and hence it is restricted to handlooms. The weaving of the Pashmina is an art by itself for it is done with a shuttle carrying the soft pashmina yarn through the fine yet strong silk warp. -It takes close to a week to get a single shawl of the Pashmina. The same loom cannot be used for weaving different products of the Pashmina and for each product the requirement of the amount of Pashmina fiber and the time varies. The best part of the Pashmina shawl making is the fringes and the designs which really requires an artistic hand or the maker should be an expert. This is the most delicate part of the making of the shawl and is time consuming. Each piece has to be hand -dyed and separate for even any small negligence may show up in the quality of the product. The shawls are eco-friendly for the dyes used are mainly free from metal and azo and the temperature used for dyeing is just below boiling point for nearly an hour. 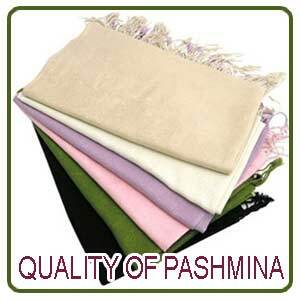 The quality of the Pashmina fabric is easily absorbable and gets in deep. Since the process of making is quite laborious and everything is done with hand the Pashmina products are highly priced. The shawl is printed with hand block printing where each design has a name and some blocks date back over a hundred years. A natural black ink is used for printing which is patted several times by the hand before it is pressed onto the fabric. After printing it goes for the hand embroidery where the Jamawar shawl even takes two to three years to complete the embroidery. The final stage is the washing with cold and a mild detergent so as to remove the dye and dirt and then at last pressed and ready for sale. Initially the wearing of Pashmina was mainly to protect the people of the mountain area from biting cold which gradually popularized and commercialized with a variety of related products with the Pashmina fabric. 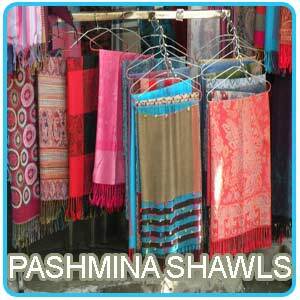 -Some of the most common and wanted products of Pashmina fabrics includes pashmina shawls, pashmina stoles, pashmina scarves, pashmina sweaters, pashmina mufflers, and a variety of other pashmina products in beautiful royal colours. The weaving of Pashmina shawls are very traditional inherited from the ancestors. A single Himalayan goat can contribute about 3 to 8 ounces of Pashmina wool per year where a Pashmina fiber is about 15 to 19 microns in diameter when compared to the human hair which is about 75 microns in diameter. Thus now even Western world is very much aware of the distinct qualities of the Pashmina leading to a great demand for this product. The Kathmandu valley of Nepal is the most famous place for the weaving of the Pashmina fabrics in handlooms. -It is sometimes weaved along with a special kind of spun silk to increase its sturdiness and suppleness. The Western world of fashion is showing more affinity for the silk bended Pashmina variety for it is extremely soft and weighs light and still keeps you warm. The credit mainly goes to Nepalese women who know the technique to give the maximum of 95% purity in the Pashmina and this skill is being transferred from them to the later generation. Most of the fashion wardrobes have given a special space for the Pashmina products. Pashmina and its related products are usually priced quite high for right from the rearing of the goat till the various steps required to get the final product is quite laborious and lot of workmanship is involved..
-The genuine quality of Pashmina varies and hence the price varies from thousands to several thousands based on the micron fineness and craftsmanship. Internationally it is priced about 300-1000$ per piece. However high it is priced the demand both in the local and the international market is quite high. The makers of the Pashmina products are now able to cater to the best of the contemporary trends and demands. Lot of intricate designs and styles are used. Impressive eye catching prints have come up on shawls and stoles which when worn along with various apparels make one look gorgeous. Printed shawls give impression of luxury women clothing. The antique cutting Kani Pashmina Shawl is very much liked by youngsters for it is skin friendly, shrink resistant and highly durable.